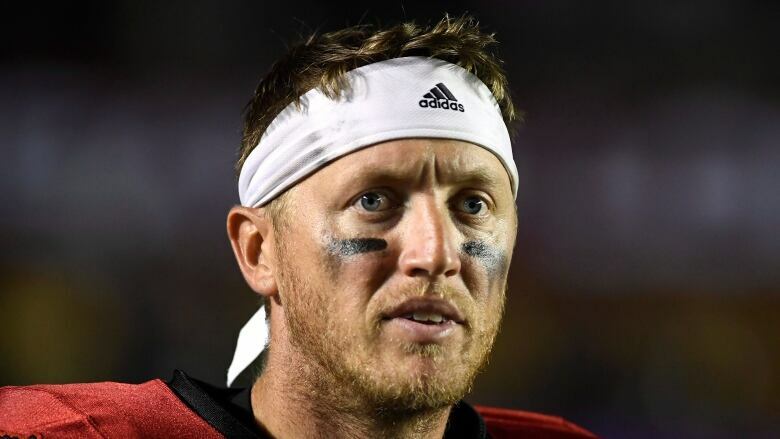 He only played half the game, but it was enough for Bo Levi Mitchell to pick up his 60th career CFL win as his Calgary Stampeders beat the Ottawa Redblacks 27-3. The Calgary Stampeders won, again, but they will have to wait to find out if they will lose their quarterback for any amount of time. Bo Levi Mitchell picked up his 60th career CFL victory as Calgary beat the Ottawa Redblacks 27-3 on Thursday, improving to 4-0 on the season. But the quarterback left the game late in the second quarter with what appeared to be a right knee injury after taking a hit from Danny Mason, who was handed a roughing-the-passer penalty on the play. He was 16 for 21 for 166 yards and one touchdown when he left for the locker room. "The update is we need to get some more testing done, I'm not a doctor on that," said Calgary head coach Dave Dickenson. "I don't think it's going to be anything majorly serious, but there's been surprises. From what I know they took a look at it him, lower-body injury, I'll use the hockey term and hopefully we get good news when we get back home." Nick Arbuckle finished the game for the Stampeders, going 8 for 14 for 84 yards and one TD. Mitchell did return to the sidelines in the second half and watched while still in uniform. Ottawa starter Trevor Harris was 14 for 22 for 111 yards and two interceptions. The Redblacks also used Dominique Davis and Danny Collins at QB, but neither was very successful. Combined the three QB's had three interceptions and two fumbles. "Everybody has to be better," said Harris. "It's not a game where I think you can point the finger at one guy, but if you need to you can point it at me because that's what I want to do for my guys and I'll make sure that we're better and I'll step up to the plate for everybody. That's the responsibility of the quarterback and I'll take that on my shoulders." Redblacks head coach Rick Campbell said his team got beat in every aspect and never found a way to respond. "We just flat out didn't respond with making any plays and obviously it's tough to do when you're playing a good football team if you don't do that," said Campbell. "It's worrisome that we never came up with any plays to create a spark. I've never questioned our guys effort or want to, but we weren't able to come up with, for whatever reason, anything to give us a spark to counter punch and come back." Calgary seemed to put the game away before the break as it held a 20-0 lead after two quarters. "We're going to go one week at a time and we're going to execute week in and week out," said Calgary linebacker Alex Singleton. "That's the only way to get back to where we were." Ottawa opened the second half with a solid drive that put it on the one-yard line, giving the 22,103 on hand some hope, but a procedure penalty pushed the Redblacks back to the six and they were unable to complete the drive, settling for an 11-yard field goal to trail 20-3. Arbuckle was able to add to the rout when he found Lemar Durant in the end zone early in the fourth quarter for a 12-yard touchdown making it 27-3. The Redblacks struggled heavily in the first half. Ottawa had six straight two and outs, Harris threw two interceptions, Diontae Spencer dropped the ball on a punt return giving Calgary possession deep in Ottawa territory and the defence had few answers for Mitchell and the rest of the Stampeders. Calgary opened the scoring late in the first half as Mitchell connected with Kamar Jorden on back-to-back passes to set up the Stampeders on Ottawa's one-yard line where Romar Morris dove across the goal line for his first CFL touchdown. A two-point conversion gave Calgary the 8-0 lead. The Stampeders extended its lead following Harris' first interception. Calgary took over at the Ottawa 40-yard line and five plays later Mitchell found Juwan Brescacin for a 10-yard TD pass. Rene Paredes kicked 17- and 25-yard field goals to give Calgary a 20-0 lead at the half.